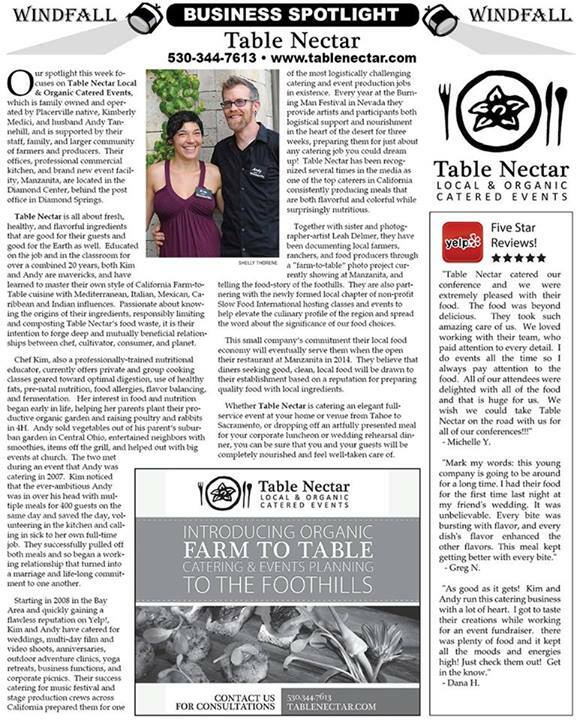 Table Nectar Local & Organic Catered Events, is family owned and operated by Placerville, CA native, Kimberly Medici, and husband Andy Tannehill a native of Columbus, OH, and is supported by their staff, family, and larger community of farmers and producers. Their offices, professional commercial kitchen, and brand new event facility, Manzanita, are located in Diamond Center, behind the post office in Diamond Springs, CA. Table Nectar is all about fresh, healthy, and flavorful ingredients that are good for their guests and good for the Earth as well. Educated on the job and in the classroom for over a combined 20 years, both Kim and Andy are mavericks, and have learned to master their own style of California Farm-to-Table cuisine with Mediterranean, Italian, Mexican, Caribbean and Indian influences. Passionate about knowing the origins of their ingredients, responsibly limiting and composting Table Nectar’s food waste, it is their intention to forge deep and mutually beneficial relationships between chef, cultivator, consumer, and planet. Table Nectar is all about fresh, healthy, and flavorful ingredients that are good for their guests and good for the Earth as well. in 4H. Andy sold vegetables out of his parent’s suburban garden in Central Ohio, entertained neighbors with smoothies, items off the grill, and helped out with big events at church. The two met during an event that Andy was catering in 2007. Kim noticed that the ever-ambitious Andy was in over his head with multiple meals for 400 guests on the same day and saved the day, volunteering in the kitchen and calling in sick to her own full-time job. They successfully pulled off both meals and so began a working relationship that turned into a marriage and life-long commitment to one another. Starting in 2008 in the Bay Area and quickly gaining a flawless reputation on Yelp!, Kim and Andy have catered for weddings, multi-day film and video shoots, anniversaries, outdoor adventure clinics, yoga retreats, business functions, and corporate picnics. Their success catering for music festival and stage production crews across California prepared them for one of the most logistically challenging catering and event production jobs in existence. Every year at the Burning Man Festival in Nevada they provide artists and participants both logistical support and nourishment in the heart of the desert for three weeks, preparing them for just about any catering job you could dream up! 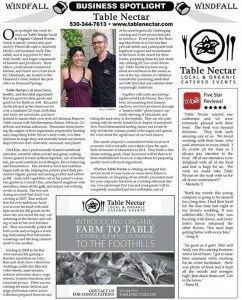 Table Nectar has been recognized several times in the media as one of the top caterers in California consistently producing meals that are both flavorful and colorful while surprisingly nutritious. Together with sister and photographer-artist Leah Delmer, they have been documenting local farmers, ranchers, and food producers through an ongoing “farm-to-table” photo project currently showing at their event facility Manzanita, and telling the food-story of the foothills. They are also partnering with the newly formed local chapter of non-profit Slow Food International hosting classes and events to help elevate the culinary profile of the region and spread the word about the significance of our food choices. This small company’s commitment their local food economy will eventually serve them when the open their restaurant at Manzanita in 2014. They believe that diners seeking good, clean, local food will be drawn to their establishment based on a reputation for preparing quality food with local ingredients. Whether Table Nectar is catering an elegant full-service event at your home or venue from Tahoe to Sacramento, or dropping off an artfully presented meal for your corporate luncheon or wedding rehearsal dinner, you can be sure that you and your guests will be completely nourished and feel well-taken care of.